Advance Tabco PRWC-24-18 Prestige Series Stainless Steel Sink Cabinet with Waste Chute - 18" x 30"
This Advance Tabco PRWC-24-18 Prestige series stainless steel sink cabinet is part of a complete lineup of upscale underbar equipment. Items found within the Prestige series of underbar equipment line up perfectly with each other, creating a uniform look across any bar. In addition to a number of eye-catching features, this item boasts an extended 7" backsplash to create a truly one-of-a-kind unit. 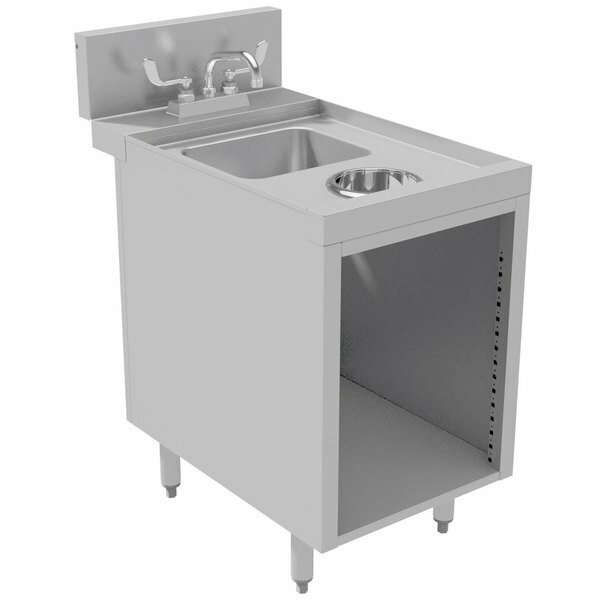 Made with 20 gauge, 300 series stainless steel, this sink cabinet is built for durability and ease of sanitation. It features a 9 1/2" x 11 1/2" x 6" sink with a 1 1/2" IPS drain that is perfect for quickly dumping leftover drinks after clearing a table. The 6" diameter waste chute lets you throw dry trash away in a trash can (sold separately) concealed in the base of the unit. It's the perfect place to toss used beverage napkins or straws, adding efficiency to your cleanup and warewashing system. This unit includes a deck mount faucet for convenience and ease of installation. The rear deck of this unit provides additional storage space. In addition, this sink cabinet comes with 1 5/8" diameter legs made with 18 gauge stainless steel and equipped with stainless steel bullet feet that are adjustable to help ensure that your sink cabinet is level. Height (not including backsplash: 29"
Left to Right: 11 1/2"
Front to Back: 9 1/2"